Standard poodle puppies for sale in Seattle. Standard parti poodles for sale in Washington state. Poodles for sale in the Pacific Northwest. Marvin's registered name is Blue Willow Sexual Healing. He is Jackson's son. He is our mascot and follows us everywhere. You can see he has a great coat. He is about 24 inches at the shoulder and he weighs about 55 pounds. Click here to view Marvin's pedigree. Penelope is Blue Willow Vicki Christina Barcelona. She weighs about 45 pounds and is 23 inches at the shoulder. She is a beautiful well built dog and she is inky black. Penelope is a lot of fun to have around and we really enjoy her! Click here to view Penelope's pedigree. Edith is Kingsdown Blue Willow La Vie En Rose. She is about 22 inches at the shoulder and she weighs about 40 pounds. She is beautiful and very refined. Click here to view Edith's pedigree. We are working to complete the testing on all of our dogs. It is our goal to have all of our dogs CHIC certified. Test results are listed on the individual pedigree pages. We feed Blue Buffalo grain free. There are a number of good dog food choices on the market. It is important to read the labels. Dogs should not be fed corn. We supplement with raw meaty bones and cow hooves to chew on. These treats are natural and digestible. Do not give poodles rawhide. It is not digestible. Our dogs are easy going and social. A well bred poodle should be bright and alert and hold it's tail up. We have a steady flow of people around, so our dogs get used to strangers. We enjoy taking our dogs out for walks along the waterfront. It is good exercise for the dogs and for us. We always meet new people. People always stop us to ask about our beautiful dogs. Poodles are alert and trainable. They excel in performance venues like obedience, rally and agility. We haven't done any obedience training since our kids were young. We are excited that after all these years we are enrolling in obedience classes again. Watch for new titles to be added to our dogs! ​Poodles require regular grooming. Poodles do not shed their hair so they must be brushed and bathed. Some people enjoy growing a big mane and a lot of hair. (Like me) Others prefer a short utility clip. The more hair you choose to grow, the more often your poodle will require grooming. 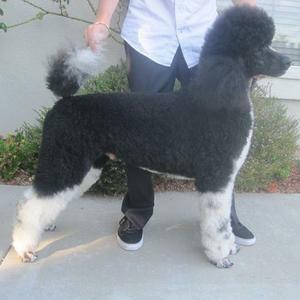 Unlike some other breeds poodles adjust to any length of coat. They are not embarassed to go out shaved down short, but they do love all of the attention they get on the grooming table when you tend to their coat.